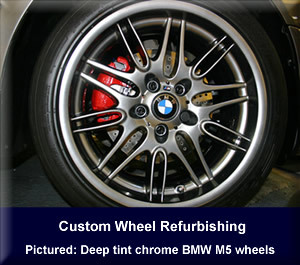 PhoenixMotorsport now offer that “little bit extra” when refurbishing your prized wheels. Not only can we carry out a standard refurbishment of your alloy wheel, with minor repairs as required, but we have the time and enthusiasm to work with you to achieve custom finishes, such as darker than normal black chrome, or that particular colour you would like them painted. A service for those difficult “split rims” - providing the seals for the 3-piece alloys and the appropriate tool for the fasteners are available. Even wheels impossible to obtain these for, may be able to be refurbished to some extent without dismantling. A powder coating and stove enameling service for steel wheels in a number of colours and can supply many of the dummy plastic fasteners used on fake split rim look wheels.